Rebel Legion :: View topic - The Droids Are Coming to Mos Eisley!! Posted: Fri Dec 26, 2014 6:30 pm Post subject: The Droids Are Coming to Mos Eisley!! Not quite a year ago Mos Eisley Base did a troop at a local middle school that had a STEM focus. The kids were brilliant, working with computers, 3D printers and yes, robotics. I thought it would be a great outreach project for our Base to partner with the school to build an R/C R2 unit. Speaking with the principal, she was extremely enthusiastic about it. Partnerships were formed, e-mails exchanged, and the project was off and running. Unfortunately, at some point, the school stopped responding to e-mails and the project fell through. 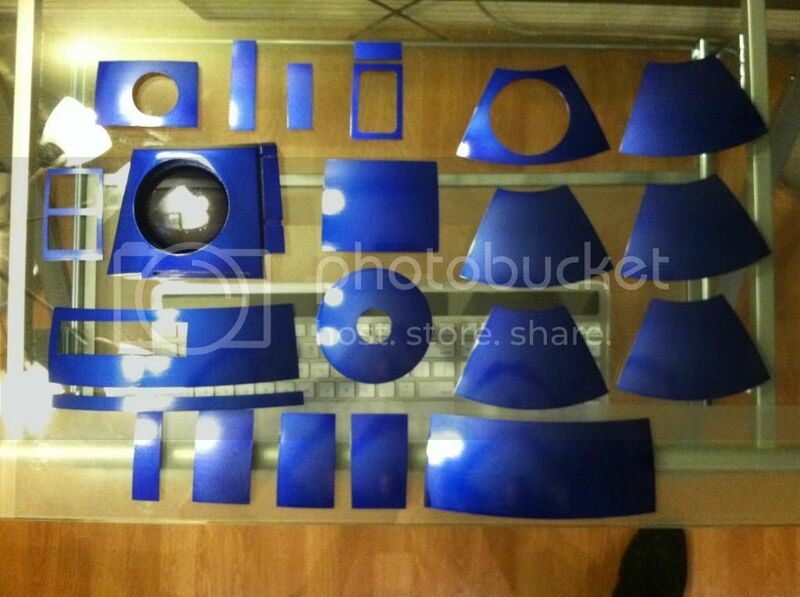 We had already acquired some basic parts for R2 that have been sitting around waiting to be either used or sold. Undeterred, I have decided to take the plunge and start the build. I've chosen to do the build thread here instead of astromech.net because I feel more at home here and there are not enough detailed build threads for R2 units on our forums. It's so nice I'm afraid to do anything with it, but it will never get built if I don't do something. 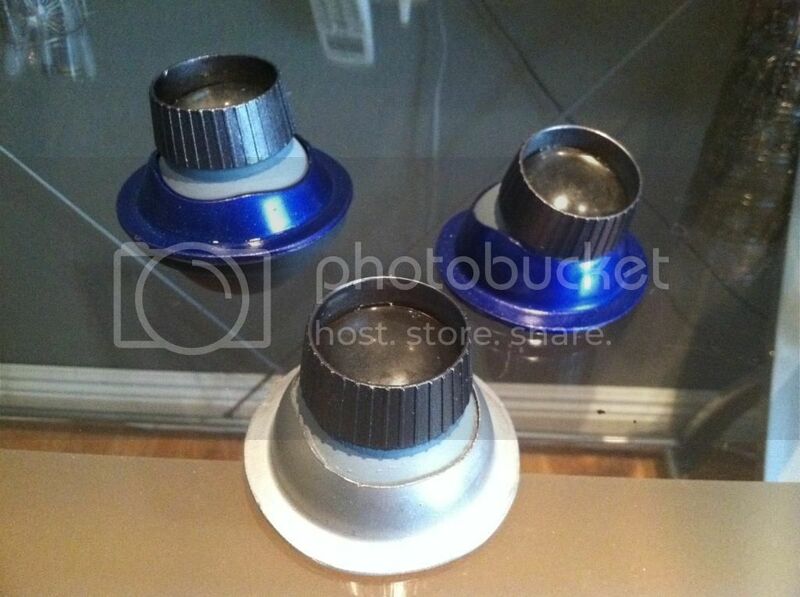 The dome is laser-cut and includes the inner dome and mounting rings for the rockler bearing. I really don't know quite what I'm doing either, so that makes it worse. Any R2 Builders who may happen to be reading, I'm eternally grateful for any advice you may have as the build progresses. I'll post more pics as the parts arrive. Now I guess I'll close my eyes, hold my breath and get a saw to start removing the panels from the dome. You may have noticed the title to the thread mentions droids coming to Tucson. A friend of mine (helotrooper) recently purchased a C-3PO costume from a member of our Base who joined the military. I'll let him tell you more about it, but from what I've seen in pictures, it is going to look AWESOME!!! Hopefully before Ep. 7 we'll have both droids joining us for troops!! At this point, the suit is very very very near to completion. Really we’re only being held up for some finishing work. As it so happens, the finishing work has been the biggest pain about the whole thing – which is not entirely unexpected, given that chroming is the bane of every protocol droid builder’s existence. 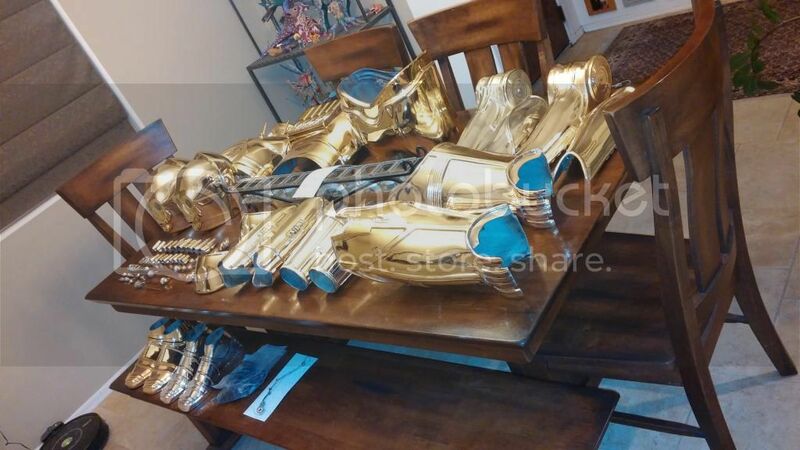 When I obtained the suit, it had been painted with rattle can gold paint, but I knew I was going to have to get it chromed to make it look right. However, had I known it would be as trying and costly as it has turned out to be, I might not have ever taken the protocol plunge in the first place. If you’re going to end up going the route I chose, you’re buying into a costly labor of love in terms of time, energy and funds. Still, once I had started down the road, I wasn’t willing to stop. My affliction is that I can’t stand the idea of not finishing a build once it has begun. Although it hasn’t taken as long as my Boba build, this 3PO has turned out to be on par in terms of expended resources. There are a number of vacuum metalizing companies out there willing to do the chroming on a suit like this, but a lot of them don’t have a lot of experience and I was reluctant to expose the suit to that kind of experimentation. Several of the companies I spoke to weren’t sure about how to suspend the suit in the vacuum chamber, leading them to speculate that they would have to drill into it to create mounting points. That didn’t sound good to me. Other companies had basically one gold shade to choose from, and I wanted more control than that. One company I talked to quoted me $800 to chrome the suit, with the caveat that they would not guarantee the finish. Another quote was for $2000. I decided to investigate another methodology... an automotive style silver-nitrate spray chroming process. There are consumer-level versions of this process, but I was not comfortable attempting it on the suit as it demanded a success the first time around to avoid having to repeatedly strip the suit and waste material. EPA laws have shrunk the market considerably for chroming work – many industry players have opted not to do it anymore because it’s too costly to get the permit for the work. I happened to find an artist who splits his time between New York and Nevada, and he’s done some rather remarkable pieces with a chrome finish. The stars aligned – so to speak – and I was able to commission him to do the chroming. Since this is a build thread, I supposed it would be useful for me to capture some of the details of the build itself. The majority of the suit is Chris Bartlett’s (TK409) fiberglass kit. In fact, everything except the head, feet, shorts and a few greeblies are Chris’s. The head is by Jim Sleeth (starbuckcyclon) – I actually have two of his heads. One is rotocast resin, with much better detail. The other is ABS plastic, and is more comfortable to wear. The feet (shells) are also Jim’s, ABS plastic. The shorts are Mon Cal’s (Faraway Creations) – also ABS. Most of the greeblies ( handback pistons, belly pistons, and screw cap details for the sides and thighs) are 3D printed, designed by Gordon Tarpley. Once I have the rest of the pieces and am able to put it all together, I’ll post some fitting pix here. All in all, I’m very anxious to see this protocol droid side-by-side with his magic trashcan counterpart... and thank the Maker they’ll be coming to Mos Eisley Base very soon! May 25th, 1977... our lives were changed forever. Glad to read that you almost have the suit finished. Ok, so it's not your chromed version of the suit, but here is Jordan's suit (with the rattle can paint) when he could actually still fit into it. 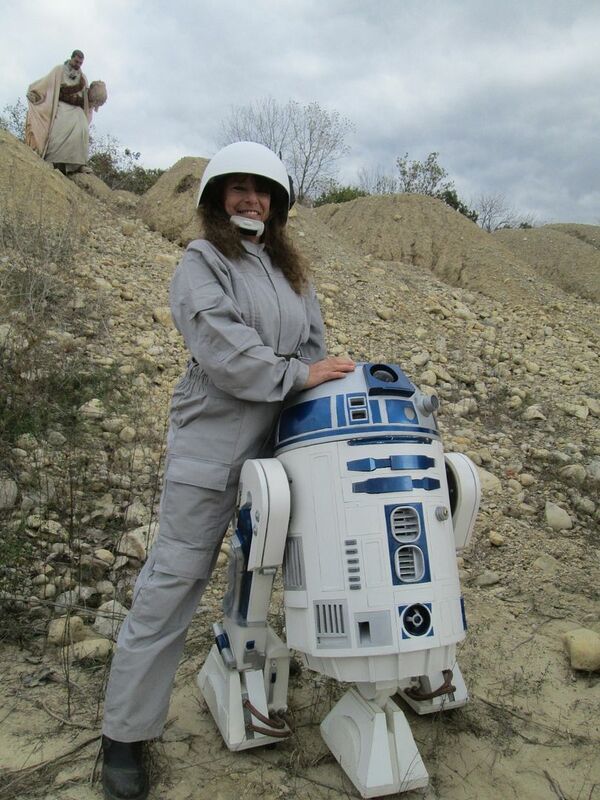 And of course My Clone Wars R2 next to him. This was taken at a Phoenix Suns game during Star Wars night a few years ago. Many folks go the spray paint route... it's just so flippin' expensive to do the chrome. We just wanted to push it over the edge, to really take it to the next level. There was a lot of prep work with these; the dome is sprayed with water to cool the aluminum while the laser cuts, so it was covered with hard water spots that had to be buffed out on the outer dome. 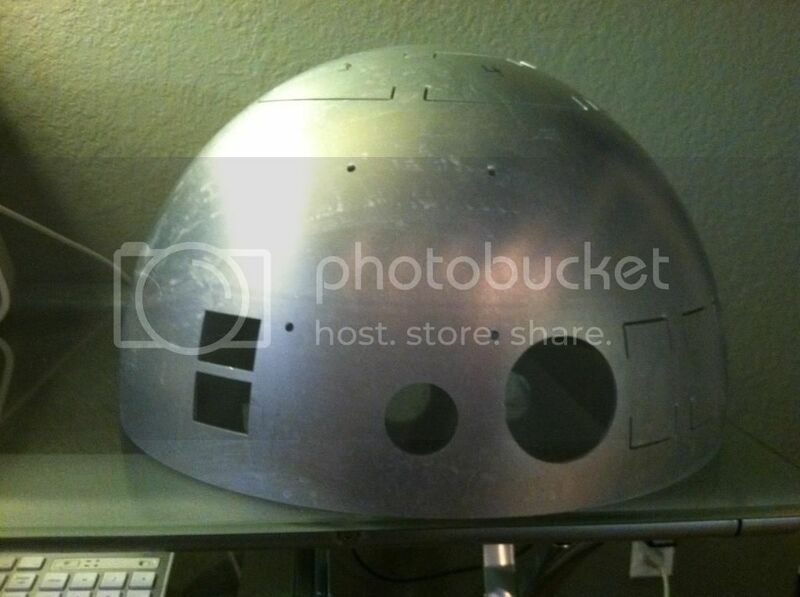 The process also leaves a lot of molten metal slag in the interior of both domes that has to be filed off and sanded to ensure a proper fit when nesting the domes and also when placing the logic surrounds, holoprojectors, etc. I was nervous about cutting, but everything seems to have come out great! Next up will be paint. Been looking into the correct color blue; R2 has a unique blue that looks royal blue sometimes and navy blue or almost black at others. Apparently this was achieved by using a purple metal flake paint for a base coat and then topcoating it with a transparent blue lacquer. Next stop, the hobby shop to look for some paints to experiment with. My goal is to produce a fairly high quality droid without spending a fortune, or taking forever to do it. Unfortunately the cost of all aluminum parts plus having to deal with waiting for part runs from the R2 Builders makes doing all metal both expensive and time consuming. I think the painted resin parts will make a nice look without breaking the bank and they're much more readily available. 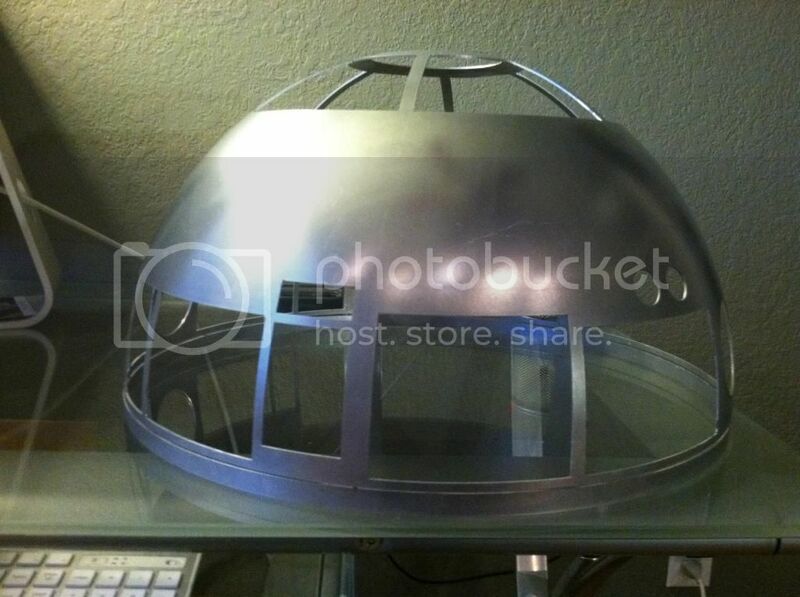 The one thing I really wanted to make sure was metal was the dome, so the cost was worth it, and the timing just happened to be right to get in on the run. Very glad I did!! Next update should include a look at the blue pieces, as well as the lights. They have shipped and should arrive soon. Just an FYI: The holoprojectors on the screen used droids were not actually aluminum in color. Since the club started machining the parts in aluminum, most members just leave them bare metal. Many, many years ago, someone actually found a Tamiya paint that matched it fairly well, but I don't remember what it was. I know I have it burned onto a disc somewhere, but most of that stuff is packed up in storage. Interesting...that makes sense, as I would assume the original part was made of plastic. That also makes me feel better about the resin piece. I'll have to pull up some screencaps and see if I can distinguish the color. I did look at some, but I saw silver...but that's probably because that's what I "expected" to see. I'll look closer. Also, it looked to me like the ribbed portion around the top of the holoprojector is kind of gunmetal colored in some shots. Does that sound right? I know the housing around the projector is the same metallic blue the rest of his accent panels are. Thanks for the info Dave, I'm glad to have your eyes on this project!! I'll see what I can come up with for a grey color. Some of the (HP) light parts were made of the very first plastic, "Bakelight" I believe it's called. It's the same plastic as those old electrical switch and outlet plates in houses built in the 1950's and 60's. In ANH all of the R2's were different. and you will see differences in the HPs as well from unit to unit. one had the blue cowling, another had the dark colored cone. The idea was that producers and tech guys wanted to be able to tell which unit was which just by a quick look so they all had specific marks on them. However, parts were often swapped between droids and many of them got repainted to look like new droids for other scenes, but you can still spot some of the markings. There is one droid in particular that has a grey colored panel on it's back. 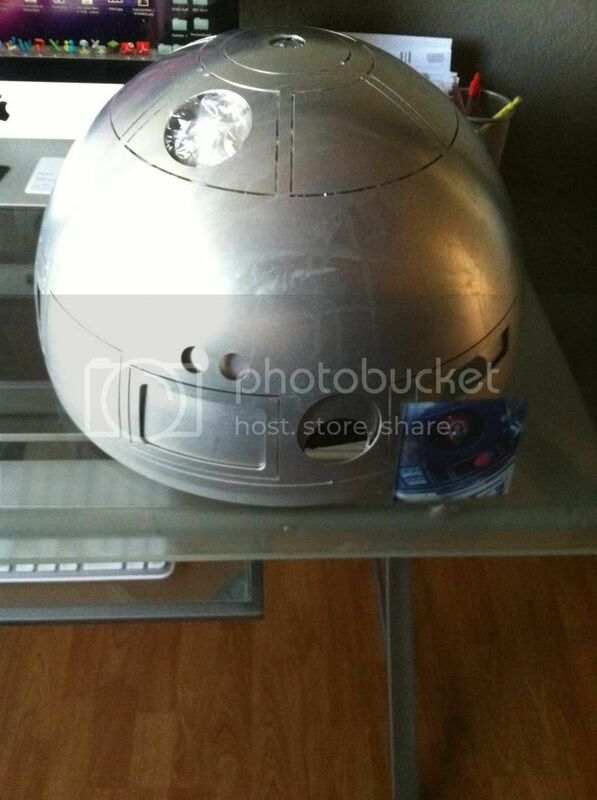 You first see it as R2-D2, then later see it on the Mos Eisley streets with a different dome on it. For ESB when more R2 units were built, all the hp's were standardized the same color on the new units. Now you can see the gunmetal type color I was talking about on the end of the HP on top, as well as the one on front. The one neat thing about this is it does give some freedom to have some artistic license. Thanks again for all the input!! Any suggestions on what to use for diffusion material for the PSIs? Hope to make lots of progress over the next week or so!! I wish I could help in your endeavor...but my poor Artoo was built many, many years ago..
and with a lot of pieces that are no longer available. ... Any suggestions on what to use for diffusion material for the PSIs? 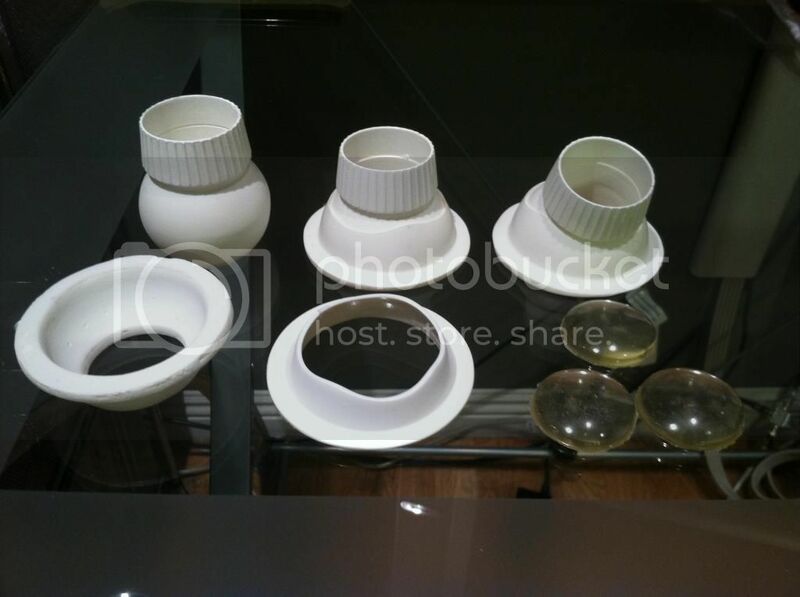 I've seen all kinds of things used as diffusion material, from white vitamin bottles and milk jugs, and plexiglass, to custom machined pieces of HDPE and urethane discs. The PSI lenses actually have a hexagon pattern to them which many have tried to replicate the look of using various materials. 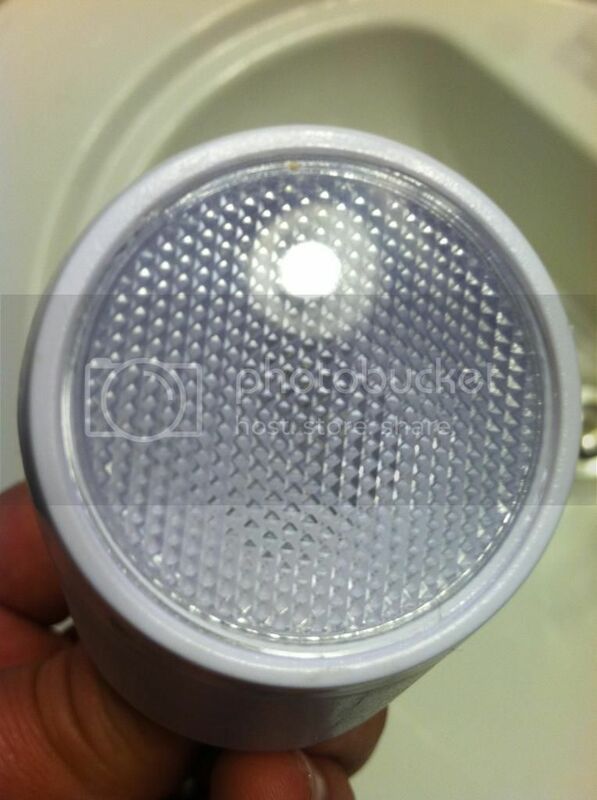 Some have simply used a piece of a florescent light fixture cover sheet which actually has a diamond pattern on it. Others search out off the shelf items that better match the pattern. I managed to find a small 110 volt halogen "spotlight" type bulb that had a lens on it with a hexagon pattern and pulled off the lens. For proper diffusion you want to have the diffusion material at least a couple inches away from the outer lens to avoid creating a bright hot spot. 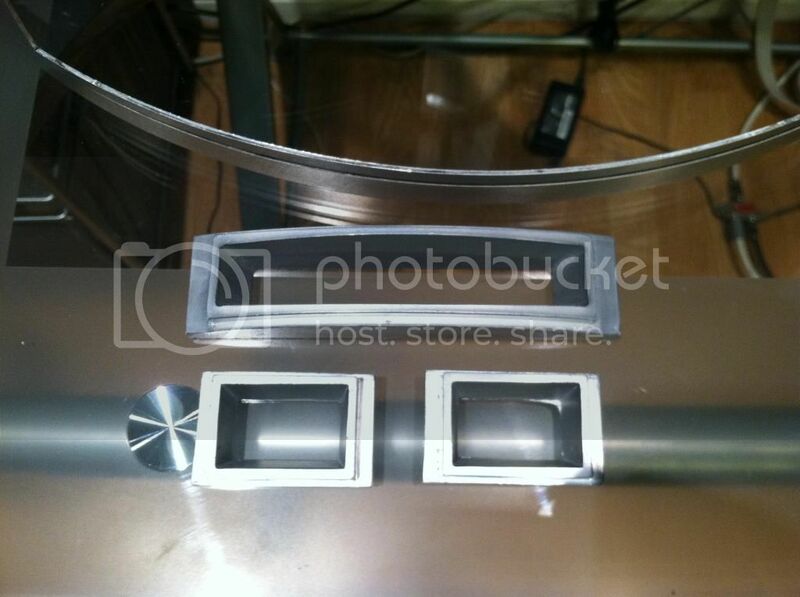 Most build a holder for their LED lights and diffusers using a PVC pipe and mount that inside the dome. Whatever you use as a diffuser, how translucent it is should be balanced with how bright your LED lights are. You want it as bright as you can get it without creating bad hot spots. Phyllis, your little guy looks GREAT!! If mine comes out looking even close, I'll be very happy!! I'm also not sure whether R/C will be in his future...right now, that's the plan, but I have little to no electronics ability, so we'll see how that goes. I always though it would look cool as the PSI lens, but I didn't think the pattern should be in there. I guess I'll go ahead and use it after all!! Only downside is it's a bit too small to use for the rear PSI. It fits the front perfectly, but maybe I'll try the halogen light idea for the rear one. I also had thought of the milk jug solution for the diffuser. I'll give that a try as well as experimenting with some other stuff. I had already planned on using the PVC to build the housing for the lights. I'm thinking I'll line the pipe with foil to increase the reflection of the lights and hopefully make them at least a bit brighter. Thanks again for the input!! I should be on vacation this week, so hopefully there will be lots more to post in the next few days. I'm really happy with how these came out. The blue portions of R2 are hard to get right, as the color seems to change so much in the film, depending on lighting. Sometimes the pieces appear a very royal blue and others navy blue or almost black. As seen in the photo, the blue pieces here replicate that fairly well. As the part curves away from the light, it looks very dark. More in the light, more blue. I achieved this look by first hitting all the aluminum pieces with a Rust Oleum self-etching primer, to help the paint adhere to the smooth aluminum. Then I undercoated them with a Metallic Purple paint; PS-18 by Tamiya. Finally, they were topcoated with Gloss Transparent Blue #1257 from Testors. As Dave previously pointed out, the body of the projector itself is grey. I painted those with Tamiya TS-32 Haze Grey, and the ribbed front was painted with Tamiya TS-38 Gunmetal. I decided to paint all three with the gunmetal to make them consistent, even though, as previously observed, some of the R2 units in the movie had holos that were left entirely grey. The projectors with the blue housings are for the front and top and were painted with the same process as the other blue metal pieces. The housing on the rear holo is painted with Testors Model Master 1451 Aluminum Plate. I've started working on the PVC housings for the PSIs, found the diamond pattern lenses for both front and back, and found a really good diffusion material, so I will post pics of those as soon as I get them put together.